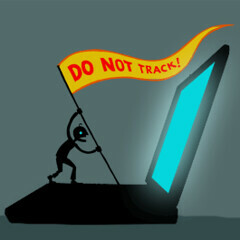 If the FCC isn’t going to enforce the Do Not Track system, what are we supposed to do to maintain our privacy? This question was answered on November 11, 2015. Much of the information contained herein may have changed since posting. Do Not Track was an attempt to create the web equivalent of the Do Not Call list, however, the complexity of tracking on the Internet is far more intricate than a simple list of phone numbers that can’t be called. Do Not Call restricts outbound attempts by companies and advertisers to contact you, while Do Not Track is asking companies to ignore the data that’s generated as users traverse their own properties. In a way, it’s like telling a grocery store that they can’t observe the shopping behavior of their customers. The FCC is essentially saying that they don’t feel that they have the power to regulate what companies track on various websites. Where this becomes a bigger privacy issue is when companies collectively share behavioral information with each other in large numbers. It would be like your grocery store sharing information about what you buy with your doctor, dentist, insurance agent, clergy and car dealer. At the root of the issue is how the Internet actually works – every time you visit a website, a digital transaction occurs that provides the web server with lots of valuable information. What general region of the world were they visiting from? How many pages did they look at? What are the most common traffic patterns around your website? How many were on mobile devices? Which operating system where they using? What started out as pretty anonymous data bits has grown to the core of commerce and advertising on the Internet. The Do Not Track initiative was started by privacy advocates and they’ve asked advertisers to voluntarily honor user requests not to be tracked. The problem is that you’re asking huge, publicly traded companies that deal with billions of users to kill a revenue generator: behavioral tracking. It’s just not going to happen voluntarily. That’s why privacy groups are pushing the FCC to step in and enforce Do Not Track standards; the problem is, there are no agreed upon standards. The World Wide Web Consortium has been attempting to ratify a standard for 3 years and hopefully they can provide a vehicle that will help either the FTC or FCC to create enforceable guidelines. The enforcement end of any regulatory change is another challenge which likely played a role in the recent ruling. If you think of it like water, the FCC is saying that they will regulate the companies that provide the water, but not get involved in how the water gets used. In the meantime, if you want better control of tracking technologies, checkout options from sites like Disconnect.Me and Ghostery. If you’re logged into accounts from Google, Facebook and many others, your usage can still be tracked by those companies and convenience and usability features on some sites may not work anymore.